The Sunday Showcase Linkup, October 2018 - Fall Home Decor. How is it already the 2nd week of October (starting tomorrow)?! That means, by now most of us have already decorated our homes for Fall, Halloween, Thanksgiving and such. Today, I bring you the 8th Sunday Showcase with my dearest friends KELLYANN from This Blonde's Shopping Bag and CHRISSY from Granola and Grace who had the pleasure of meeting each other in real life this week, as the two of them and 4 other bloggers all met up in Nashville and I can imagine how much fun they had. I loved peeking through their Insta stories. For my Showcase this month I am showing you how I have decorated my home (a little) for Fall, this year. I took these photos this past Friday morning before going to work and I am so glad I did because it has been so grey and rainy all the last two weeks. At least the sky was clear that morning. 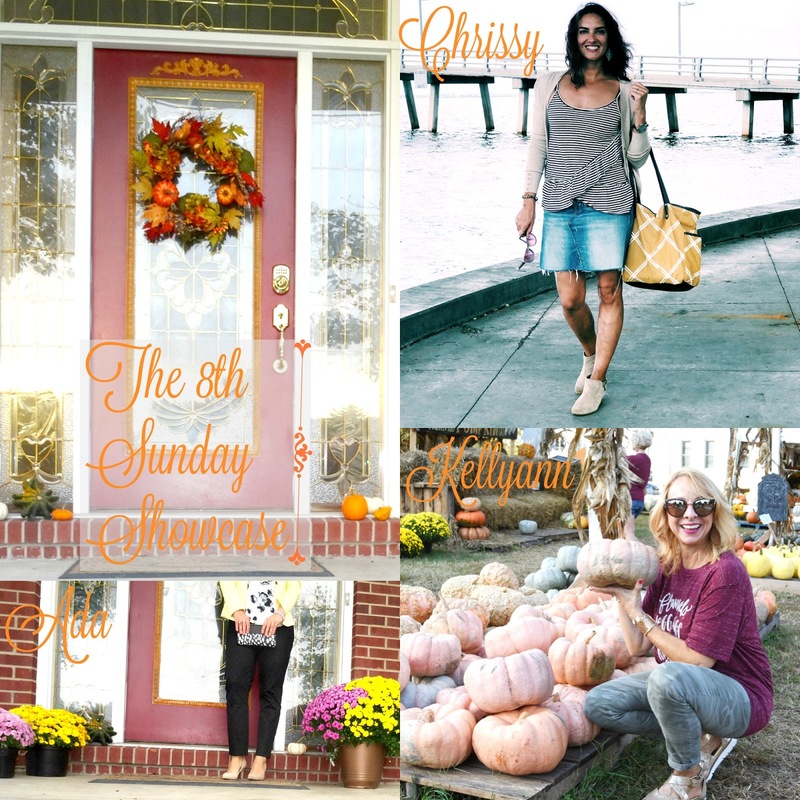 Meanwhile Kellyann has a beautiful Fall post featuring lots of pumpkins and Chrissy shows us an everyday outfit of how she does Fall in warm+sunny Florida. If I would describe or name a theme for my Fall home decor this year, the theme would be: "Pumpkins and Gourds" because those are the two main items I have used in the few areas I decorated, such as the front door/front porch, the formal dining room table, the entertainment/tv area, the fireplace, the side coffee table and the side of the kitchen island. I went with a lot of real gourds and pumpkins, some of which were purchased by a local grocery store and some at a Farmer's market where I bought the two smaller plants of mums, as well. The large tri-color yellow/lavender/white plant of mums was bought at Meijer and it was a steal for under 20 bucks. As you will see, even-though I have used a lot of pumpkins and gourds, I haven't gone overboard with decor and I prefer it that way. A few things here and there for some touches of Fall. My living room, the mantle area and the decor of the living room in general has some Fall colors already. Not pictured are a couple of the bathrooms where I added some Autumn candles. The focal point of the Fall decor is our front door or front porch area - which is also the first thing you see from the outside. I think it came out so cute and so inviting. 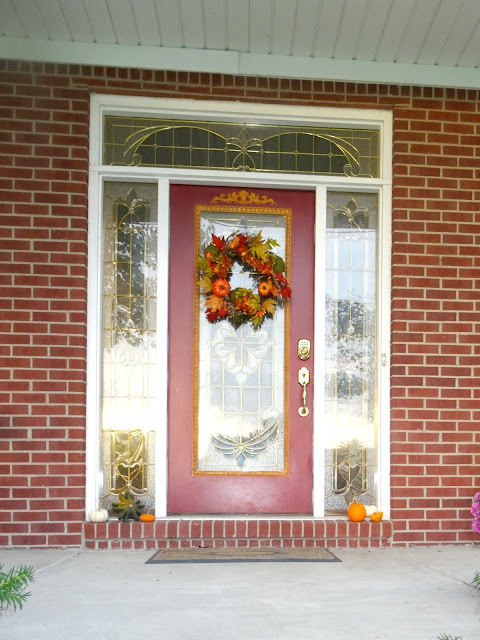 The wreath is stunning and I added 3 small pumpkins/gourds in orange+white on each side. Then, by the two main poles in the front of the house I placed the large mum plant on one side and the two smaller plants (who were a steal at $5.00 each from a local Farmer's Market) on the other side. The dining room table has a bunch of neutral micro-suede pumpkins added to the rest of the centerpiece. They are all in different neutral colors: light grey, light green, olive green, dark moss, navy, dark green and ivory. They were a dollar each at Target. I also added two porcelain pumpkins on each side. There is a tray of gourds laying on the bottom of the fireplace, surrounded by 3 cloth pumpkins (I love the plaid and the striped one, but the knitted pink one is pretty too). I purchased the 3 hand-made pumpkins last Sunday at a small business owner during the Pumpkin Fest I attended and I could easily buy 2-3 more but at 8-12$ each they weren't so cheap. I love all the Fall colors on top of the mantle and that stunning watercolor vase got two branches of pumpkins added to it too. 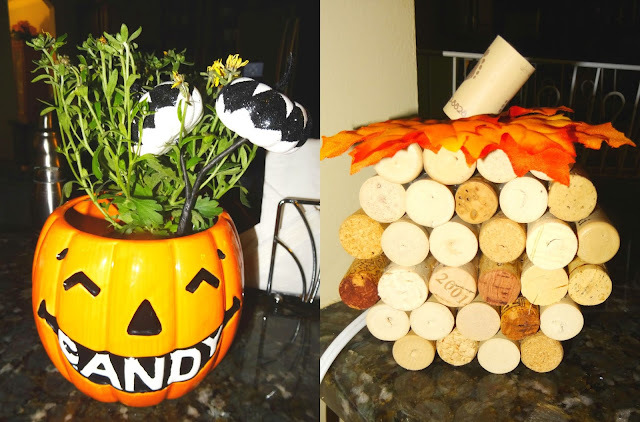 Those branches of pumpkins, the candy porcelain planter (as is) and the adorable wine cork decoration, as well as the bouquet of orange peonies I put inside the China cabinet in our dining room were all purchased at a local boutique. I love supporting and buying from little businesses but things can easily add up lol. If I am being honest, everything I decorated with was purchased this year because I seriously didn't have time to dig through my boxes in the basement where all the cloth/suede/velvet pumpkins and other Fall decorations were. Of course all the real flowers, pumpkins and gourds are seasonal and have to be purchased fresh every Fall but I love that unlike previous years I didn't go for gigantic pumpkins this year. And my favorite purchase of all was the beautiful hydrangea+pumpkins+gourds wreath that I purchased from Home Depot, at a very reasonable price. That baby will be staying all the way through Thanksgiving. 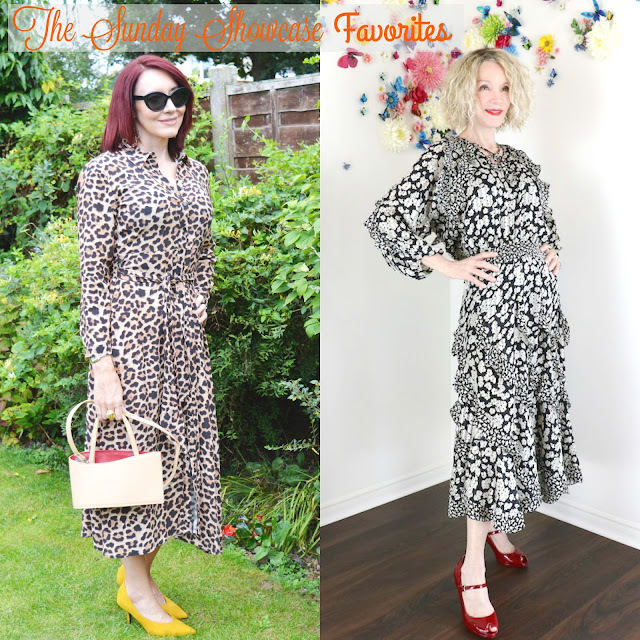 Below are the two awesome stylish ladies I am featuring today from September's Sunday Showcase Linkup.. What they have in common is that they both shared posts featuring two stunning long-sleeve dresses, perfect for Fall and they can go from a stylish office to a fancy restaurant. I love the midi length of the dresses and the fabulous prints. Both of these beauties chose to pair their dresses with Gorgeous Fall-Hued Pumps, too. Bold and Brava, ladies!! Emma from Style Splash has on a retro yet modern, always-in-style and classic 'Zara Leopard Print Shirt Dress' and whether you have a Zara around or close by you or not, you should find yourselves a wrap-style or shirtdress-style Leopard Dress from a different brand. Even-though it is bold, you will be able to wear it a lot. It seriously goes with everything. Loving the Kitten-Heel Mustard Pumps and Butter-Yellow Bag (love the peaking of red from the inside) that Emma chose to style her beautiful leopard dress with. And you have to see her post and take a peak at the stunning animal ring she sported. Patti from Not Dead Yet Style is full of cascading ruffles, curls, red lipstick and redder-than-red peep-toe pumps. She normally has a different location for her photos and takes her own pics. This time she shows us 'What a Difference a Photographer Makes' as one of her blogging buddies shoot these outfits pictures of hers. If you stop by her post, you will see that she styled another stunning printed midi-length dress. With both of these dresses, this over 60 beauty shows us that style is ageless. 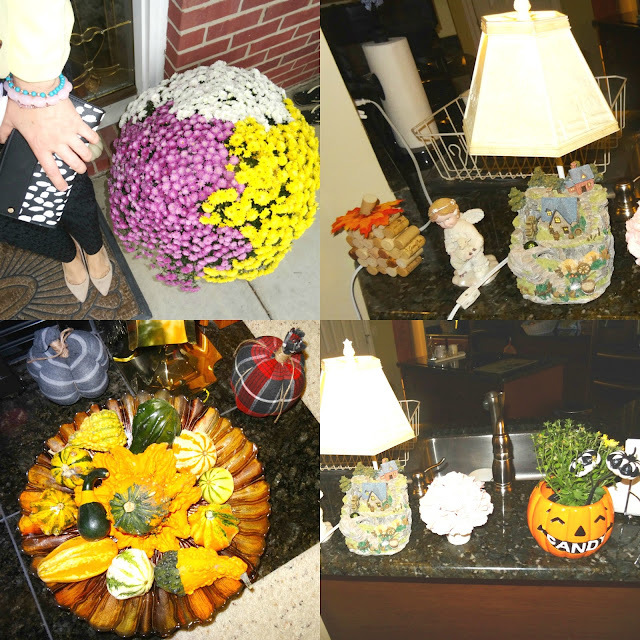 Did you decorate your home for Fall this year?! How did you decorate it?! Let us see it and 'showcase' your beautiful home, or front porch or office by joining "The Sunday Showcase" linkup with your posts. Have a Great Sunday! !